"I grew up on the West Coast where these tasty little treats are found. You can vary the amount of ingredients used in the recipe according to the number of clams you have, but be sure to use real Parmesan cheese and only panko crumbs, not regular bread crumbs. Pound the necks with a meat tenderizer, or deep fry them, if desired. These are delicious!!!" Place a sheet of wax paper on a flat baking sheet sized to fit in your freezer; set aside. Beat eggs together in a bowl. Stir together the four, salt, pepper, and garlic powder in a second bowl. Mix together the panko and Parmesan cheese in a third bowl. Flour the clams well, shaking off any excess. Dip clams into the eggs, then into the panko mixture, pressing it evenly onto the clams. Place on prepared baking sheet, cover with wax paper; freeze until firm. Heat oil in a skillet over medium-high heat. Fry clams until lightly browned, about 1 minute on each side. Do not overcook or they will become tough. Place on paper towels to drain. 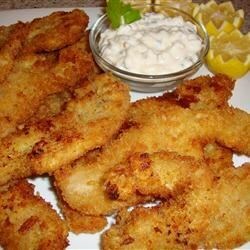 The nutritional analysis for this recipe reflects the full amount of the coating and breading. We have determined the nutritional value of oil for frying based on a retention value of 10% after cooking. The exact amount will vary depending on cooking time and temperature, ingredient density, and the specific type of oil used. Have to spice these up, My husband and I found this recipe bland. We absolutely love this recipe! My husband never really cared for the clams until we tried this. Now he loves them! It's the only recipe we ever use. Thanks for sharing your recipe!